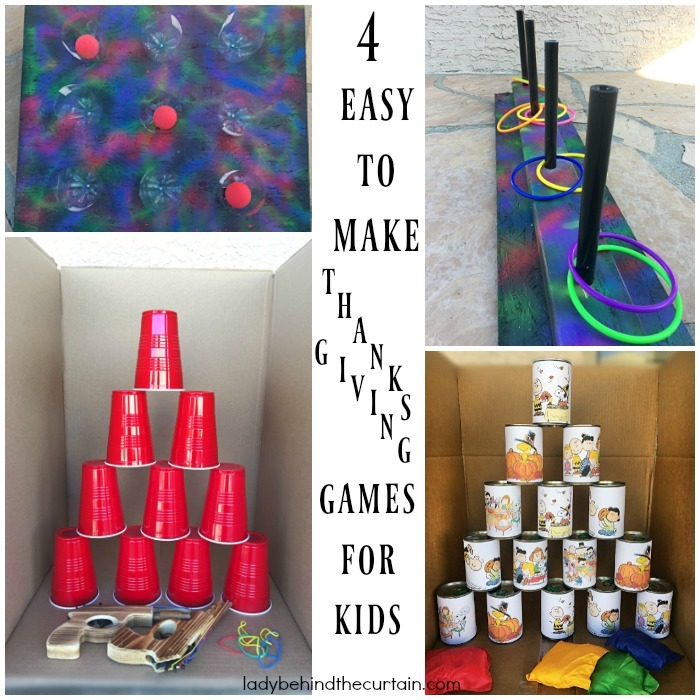 4 Easy to Make Thanksgiving Games for Kids | Take away the electronics on Thanksgiving and create some fun carnival like games that can be played indoors or outdoors. The way you run the games is up to you. 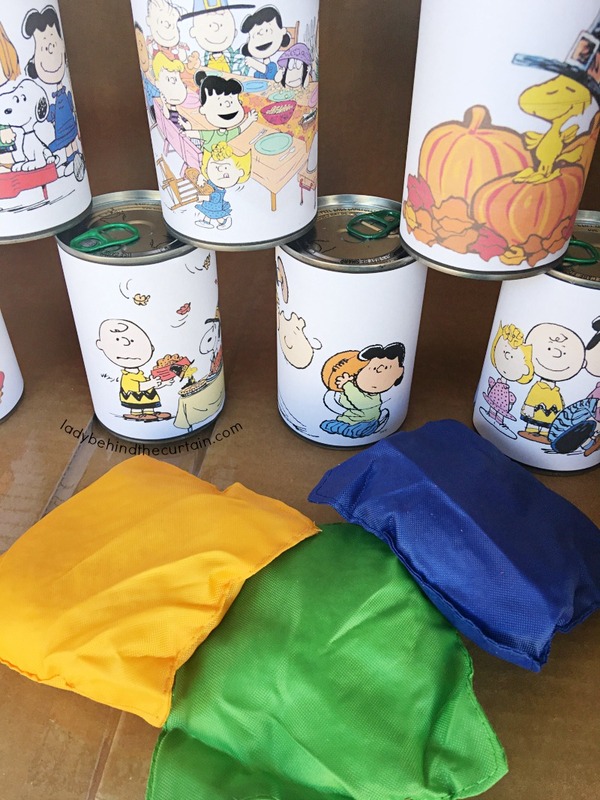 These ideas are great if you have a mix of older and younger kids. The older kids can man the games and (if you choose) the ticket counter. POINT SYSTEM: Set the games up on a point system. Example: one point per hoop up to the last two hoops then two points per hoop. Each toy is worth so many points OR the player with the most points wins! GRAB BAG: Example: One hoop is worth one toy (everybody is a winner) Seven hoops is worth two toys! Have a grab bag full of little toys. No peeking! Have the kids reach in and grab a toy! EARN TICKETS: The ticket system works that same way as the point system but instead of earning points they are handed tickets. The real difference is they can then go to the “ticket counter” to spend their tickets. 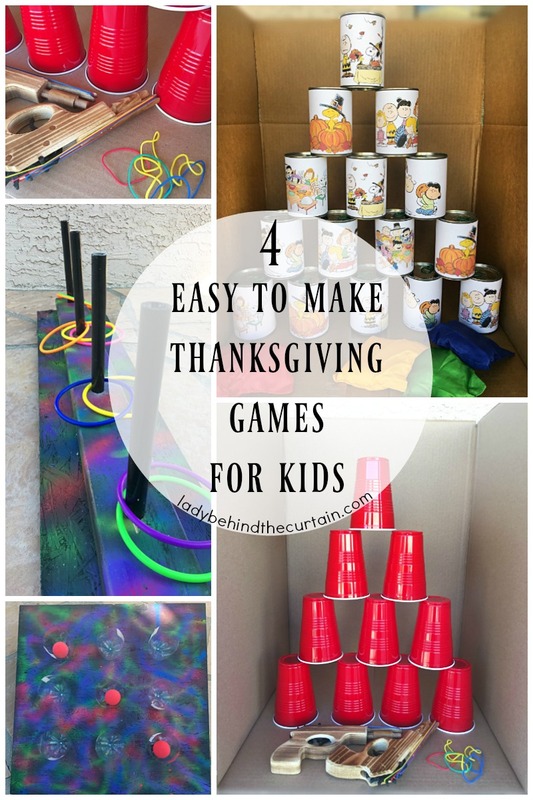 Of course the kids could play just for the fun of it (no prizes needed)! This fun game is super easy to put together. All you need are empty can and bean bags. 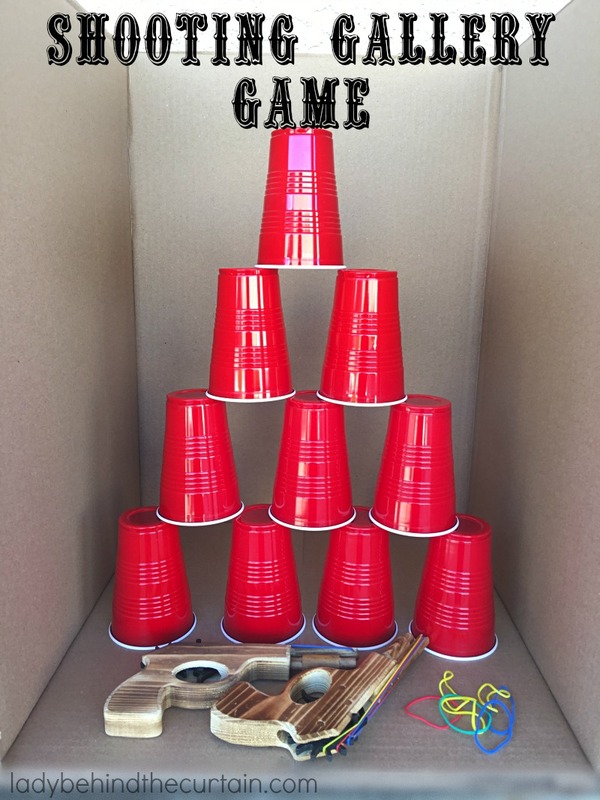 Because I had this game and the shooting gallery game side by side, I cut out the front side of a large box (from Home Depot), placed the cans on the bottom. This helped control the bean bags and the flying rubber bands. 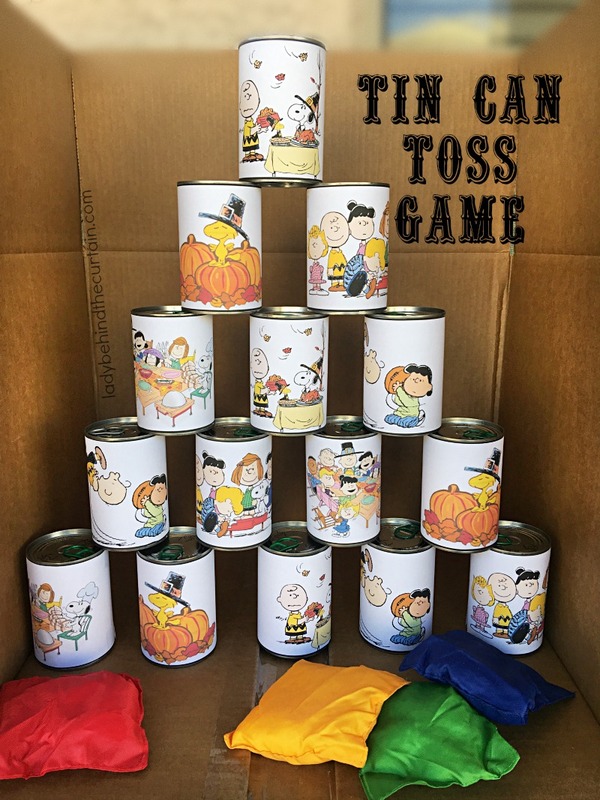 You can leave the cans as is or look at my free printables↓↓↓↓. There are THREE styles to choose from with FIVE of each style. Click here for the bean bags—->>>> 12 BEAN BAGS. RULES: These rules are just a suggestion. 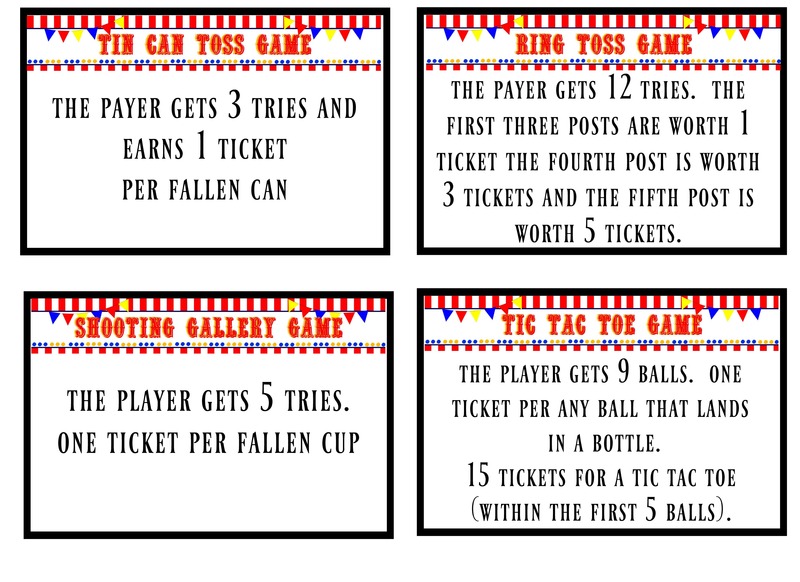 The player gets three tries and earns 1 point or ticket per fallen can. This game can be made with scrap wood. 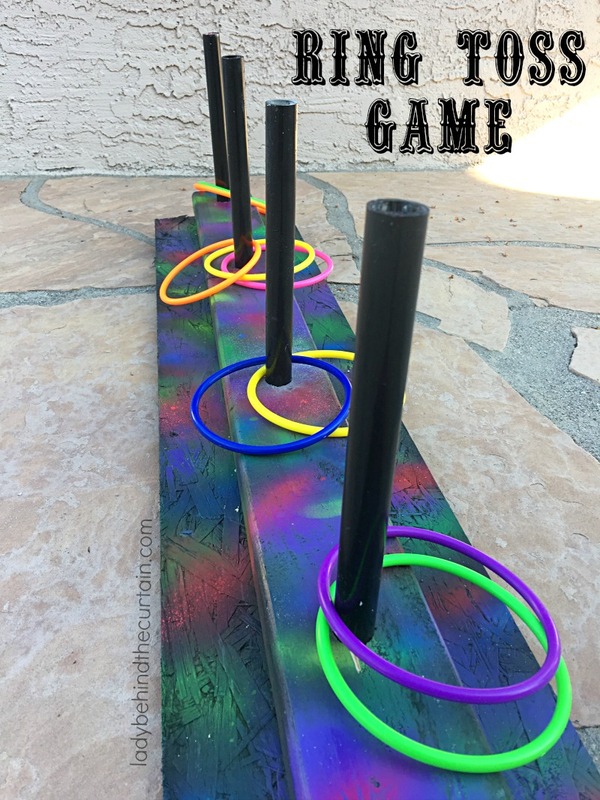 I used a 2×4 and pvc pipe to create this easy fun game. I also used leftover spray paint. For easy storage nothing is glued or since it was made with scraps you can toss it without feeling guilty. 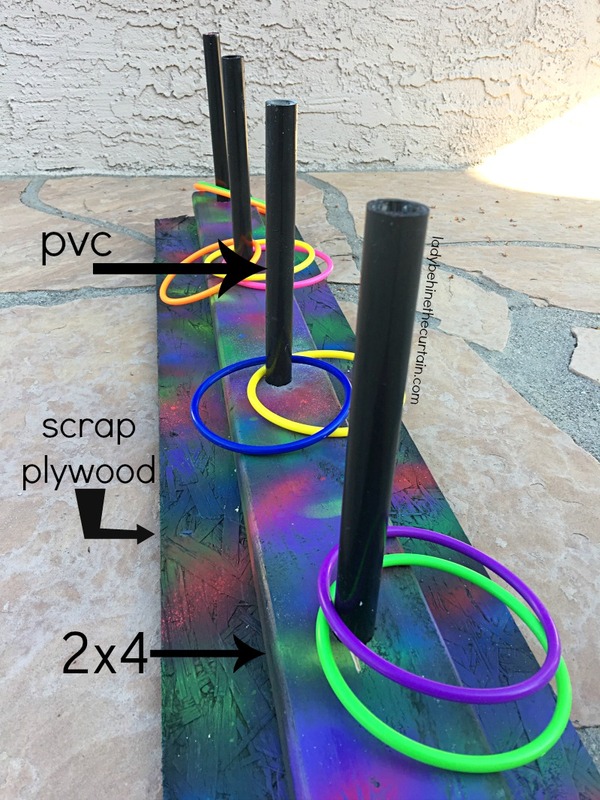 Click here for the rings—->>>>PLASTIC MULTI COLOR TOSS RINGS. RULES: These rules are just a suggestion. There are 5 posts. The player gets 12 tries (it’s harder then it looks). The first three posts are worth 1 point or ticket the fourth post is worth 3 points or tickets and the fifth post is worth 5 points or tickets. This game is so much fun. I created for my 8 and 6 year old granddaughters. Originally they had to shoot the rubber bands with their fingers. It proved to be too hard for them to master so I added guns! Solo cups and rubber bands! Simple and classic! 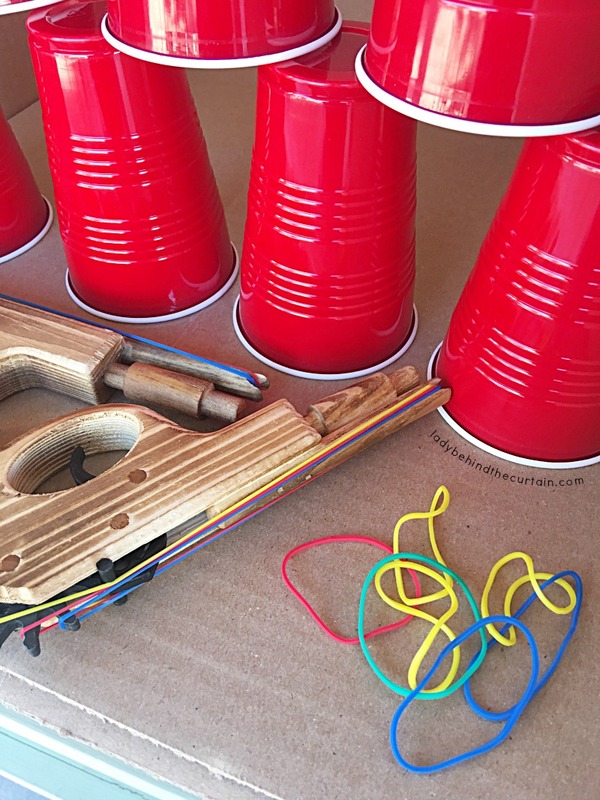 Click here for the guns—->>>> 2 PACK RUBBER BAND GUN. 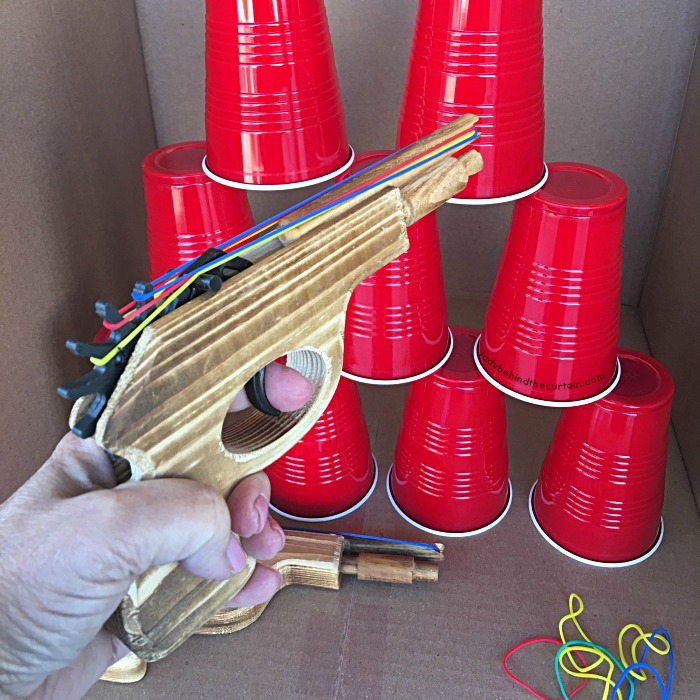 The guns come with rubber bands but not enough…..I found the perfect ones at Dollar Tree. The same colors and size! RULES: These rules are just a suggestion. The player gets 5 tries. One point or ticket per fallen cup. A scrap piece of plywood, some cut off 2 liter bottles and you have a game! 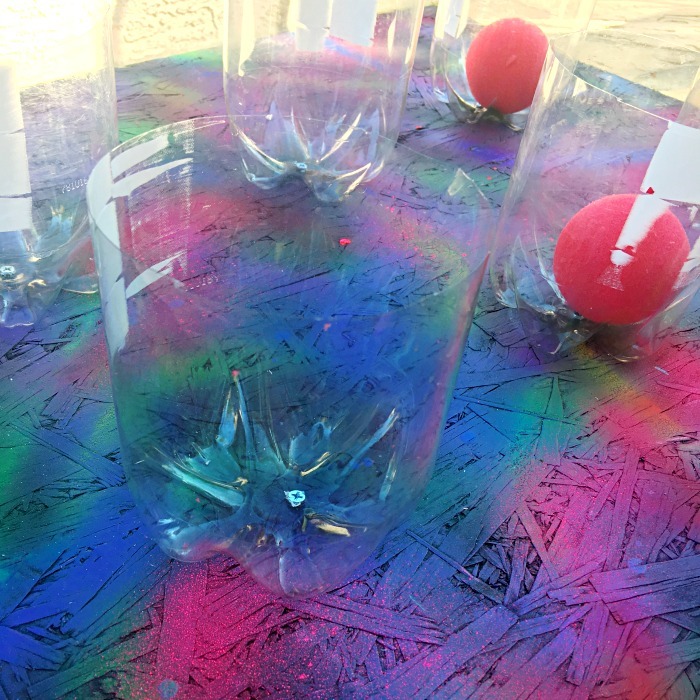 Again I used leftover spray paint and screwed the bottom of the bottles to the plywood. 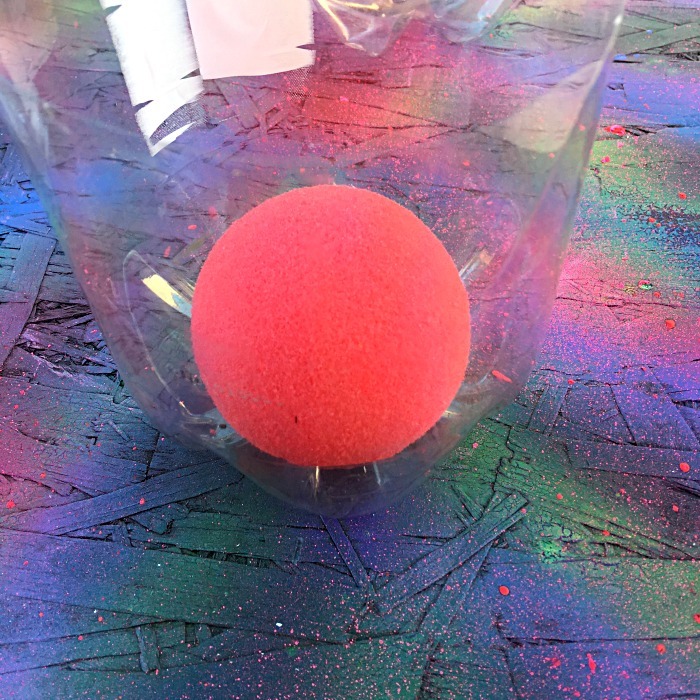 Click here for the balls I used—->>>>COLORFUL SPONGE BALLS. Simple paint job: Spray the board with black spray paint. 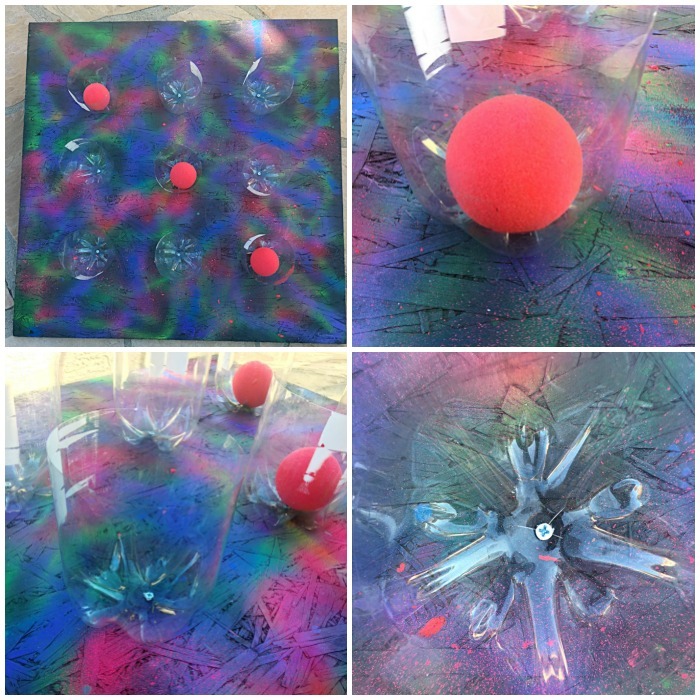 Then use up whatever cans of leftover spray paint you have to make dots, swirls and splatter effects. Cut bottle about 6 inches from the bottom using a box cutter and scissors ( remove labels, you can scrub the glue off or leave it). Screw bottles to the board. RULES: These rules are just a suggestion. The player gets 9 balls. 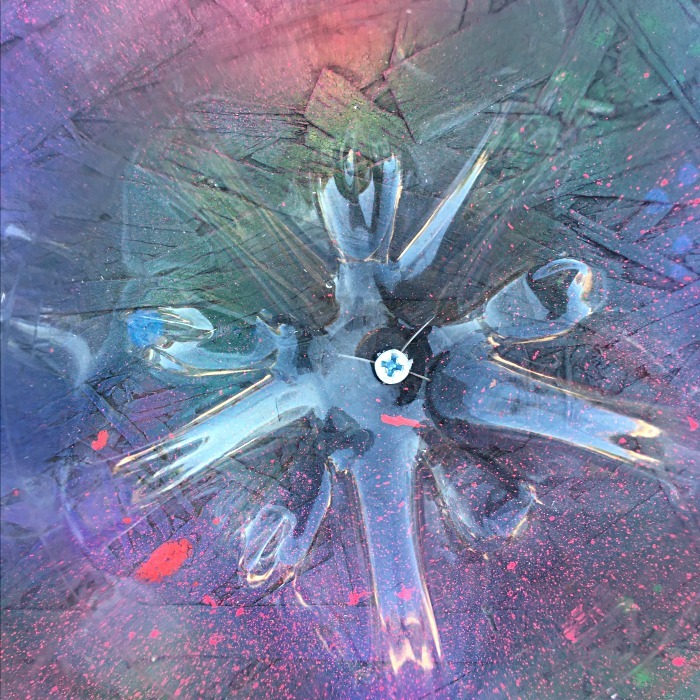 One point or ticket per any ball that lands in a bottle. 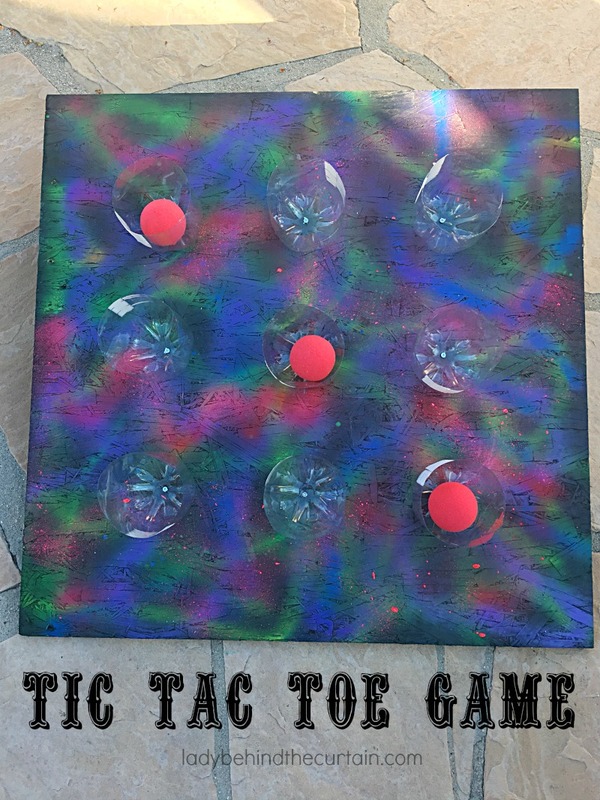 Fifteen points or tickets for a tic tac toe (within the first five balls).